One of the reasons I enjoy the holiday season so much is because the extra time off work allows me just a little more flexibility with my schedule. This past holiday I tried to use this time away from the desk to be just a bit more deliberate with my wildlife observing. Ordinarily, I like to roam far and wide and just come across whatever I happen to come across, but this time I thought I might try something a slightly different. For three days in December I made my way back out to the same spot and just sat and waited and watched—sometimes for hours. It was a thoroughly enjoyable experience, but the results were mixed, as you shall soon see. Day one was something of a dud. 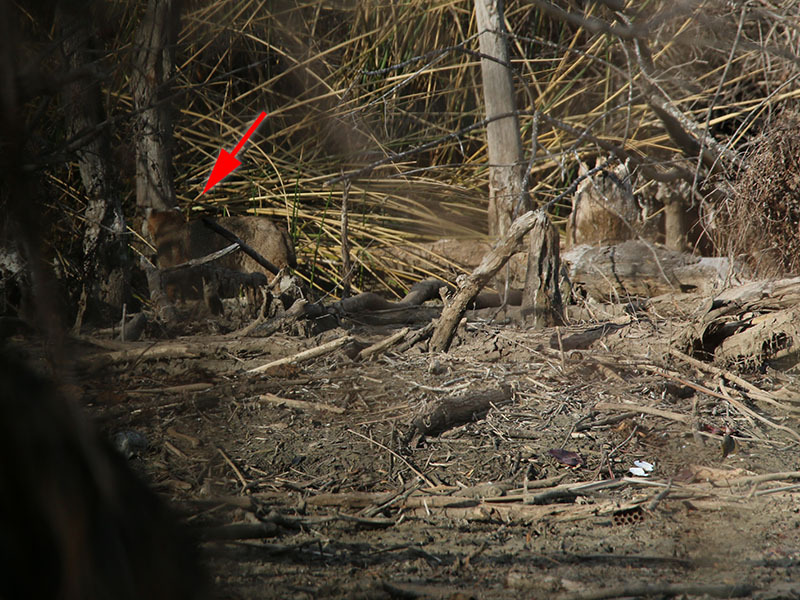 For reasons that are often hard to put a finger on, sometime the wildlife just does not show up. This was one of those days. But, it was not a total loss and there were many hints about the potential of the days to come. 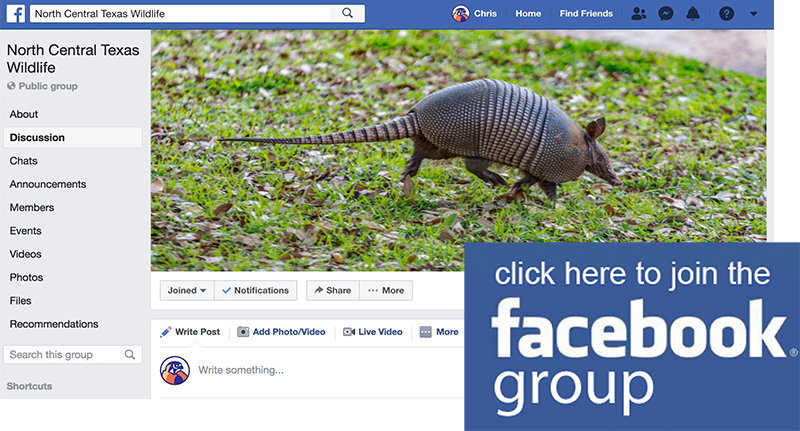 Armadillos were everywhere, and I came across several of them foraging roadside. 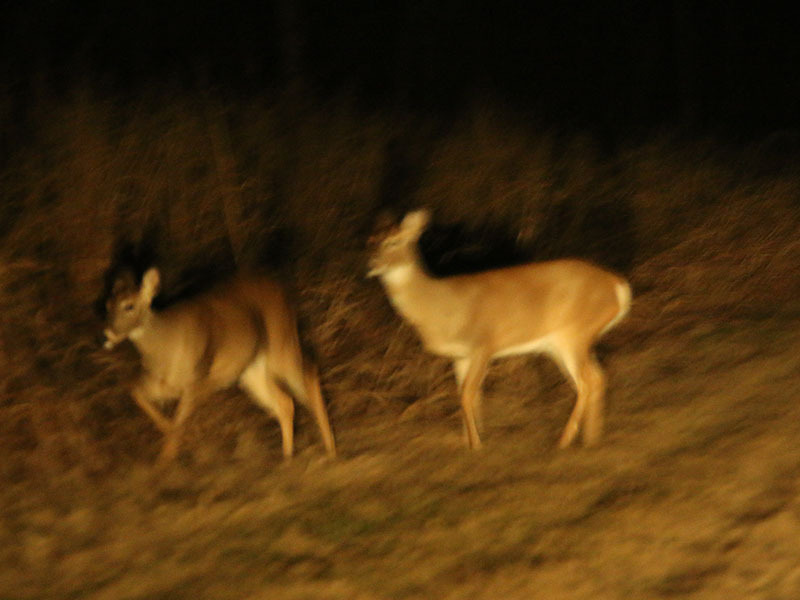 I even spotted a deer or two at a distance as I made my way into the park. Best of all, I spent some time chatting with the Park Ranger—something that I rarely get a chance to do, but something I am alway glad to have done. Lots of good information was exchanged in that conversation, I think. And then there was the sky. 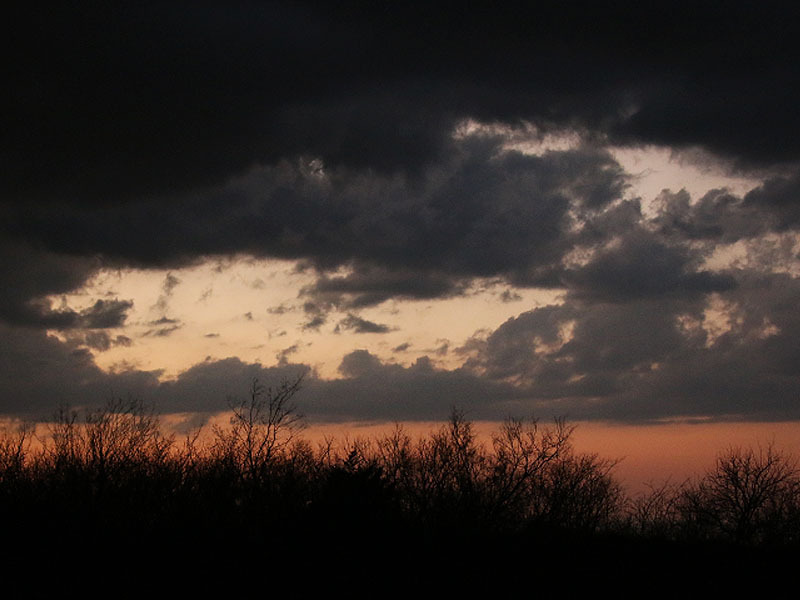 Big, gray, painterly clouds were draped high above as the day began to wind down. When the sun slipped down behind them it created a drama that was a joy to behold. 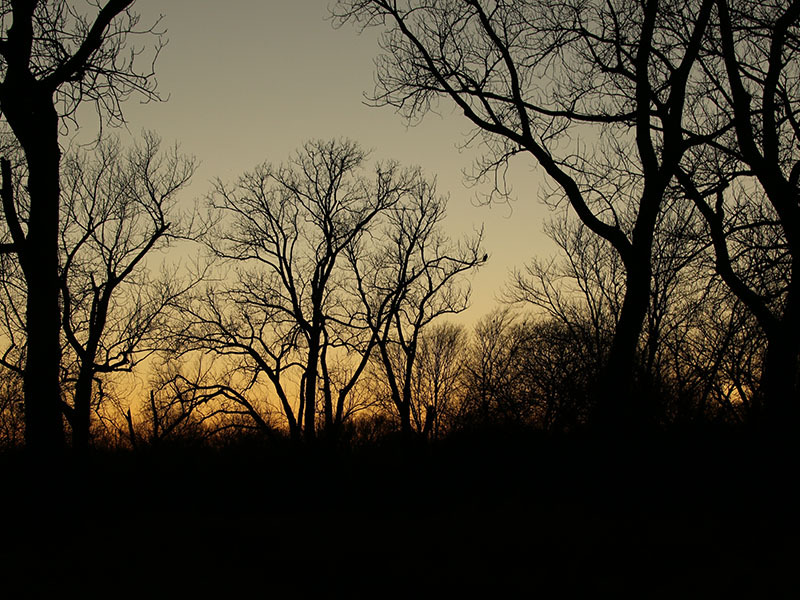 Sunsets in North Texas can be spectacular, but there is something really special about the end of the day in early winter when you can feel that first nip of Jack Frost in the air. 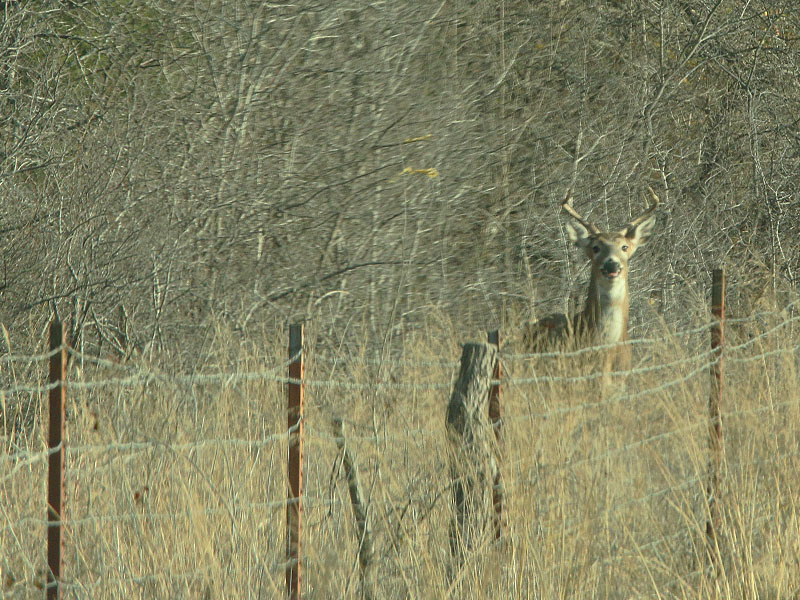 Through the windshield, a curious buck! 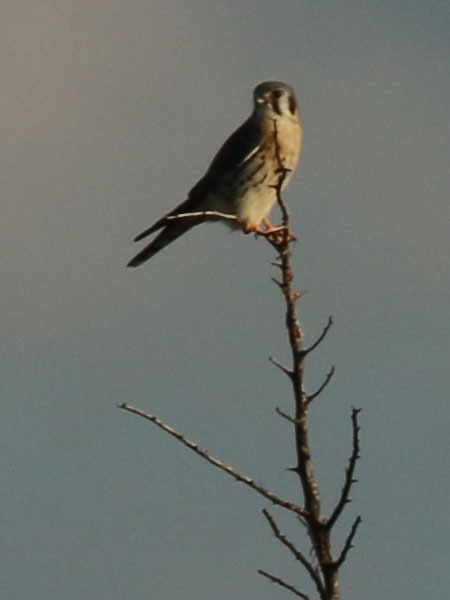 The American Kestrel, our smallest falcon. 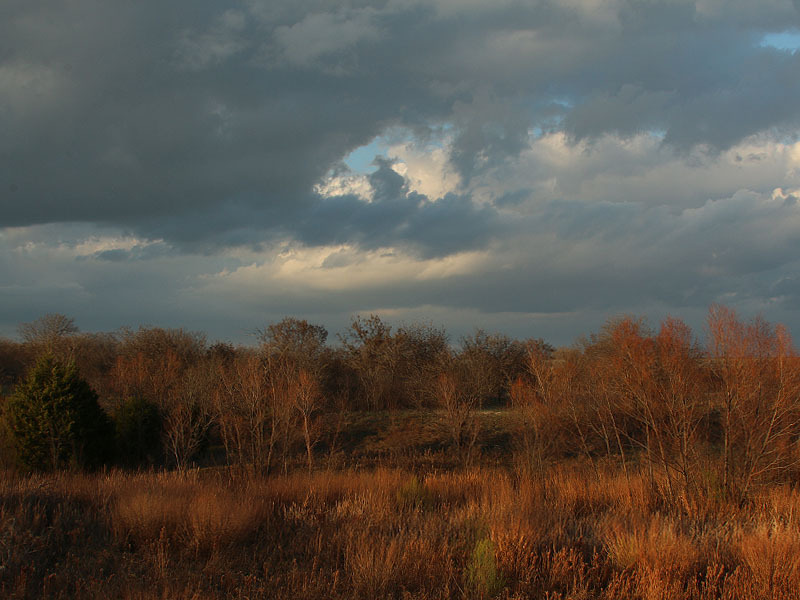 Early December in North Texas. On my next trip out the sky was clear and blue. Really beautiful. The temperature was cold, but when the sun was on you it chased away the chill. I arrived late in the afternoon and had roughly three and a half hours of daylight to kill. 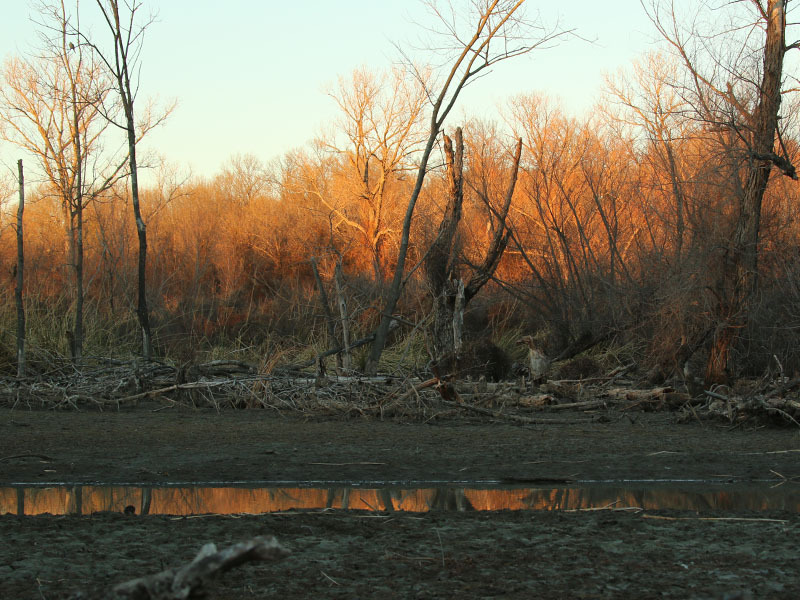 I headed off toward my predetermined spot by following a well worn trail along side the Elm Fork of the Trinity River. 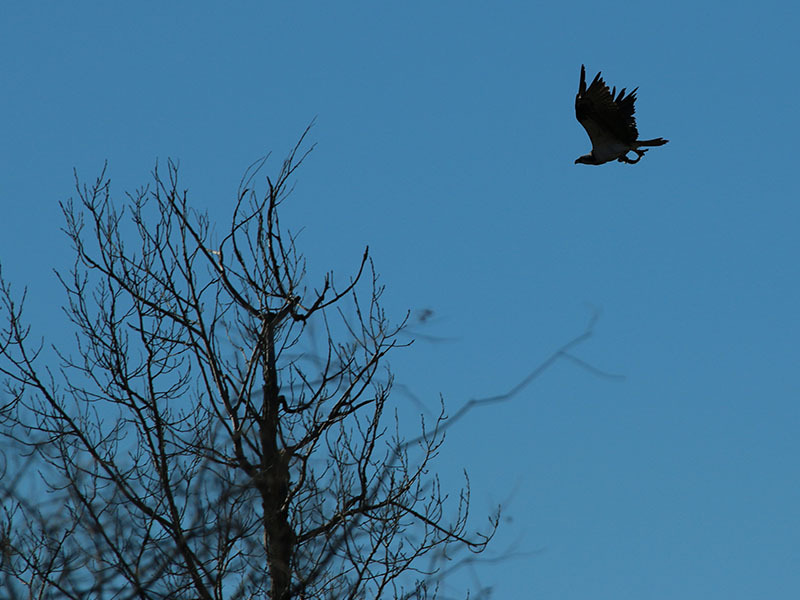 An Osprey searching for fish in the shallow, fast flowing river water circled overhead and kept me company as I went. 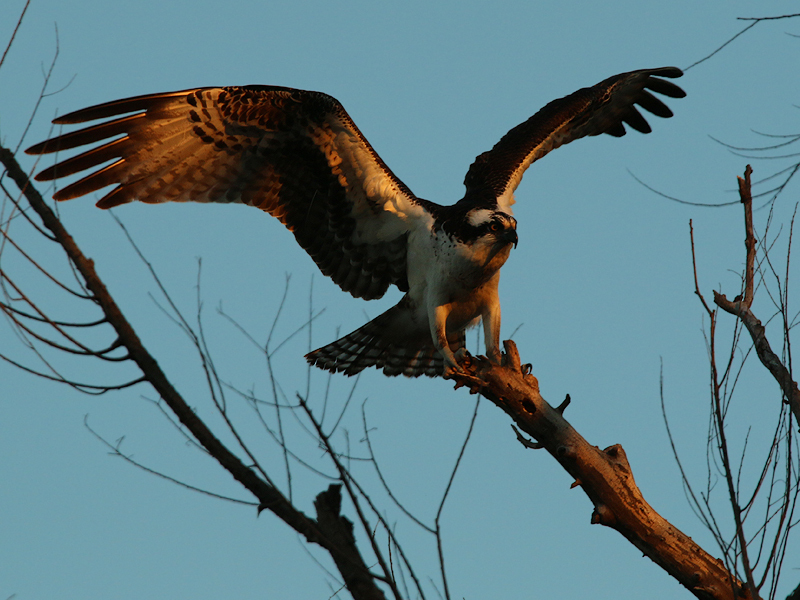 …and Ospreys by the river! I reached my destination just a few minutes later. I had along with me a camping chair which I unfolded and arranged. I sat and quickly made myself comfortable for the long haul. The first wild critter made his appearance before I even had a chance to pick up my camera and check the settings. There before me a large Bobcat materialized out of the brush on the far side of the flat, working the margins and moving away from me. Within just a few seconds he was gone from sight. A disappointingly short sighting, I thought, but not too bad for a first encounter. I believed I was off to a good start. Unfortunately, I was wrong. Over the next three hours not much happened. A few pedestrian birds passed through—a Northern Cardinal, a Northern Flicker, and a stoic Great Blue Heron, but other than that not much was going on. This outing was shaping up to be just a slow and relaxing afternoon outdoors—which, of course, was just fine by me. 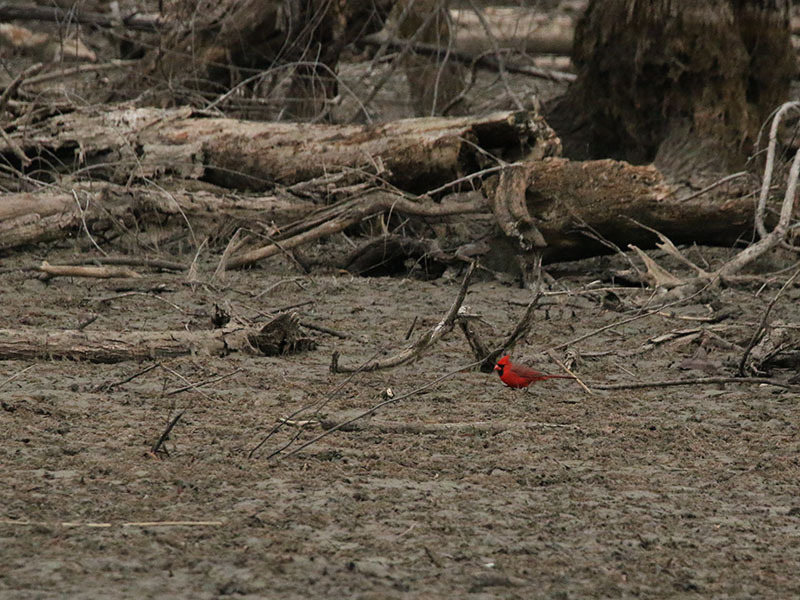 A starkly red Northern Cardinal foraging on the gray mudflats. 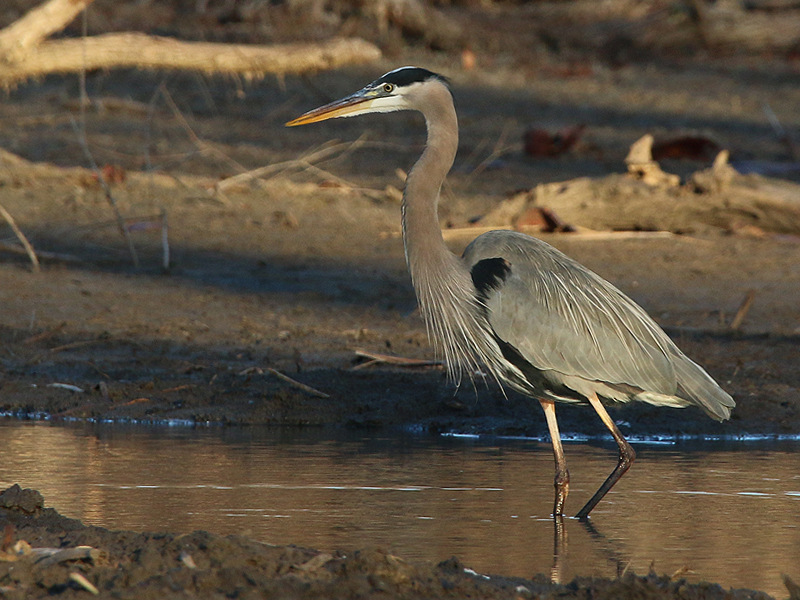 A Great Blue Heron hunting the stream bed. Feeding in a silver minnow. It wasn’t until after I packed up and began to head out that things really started getting interesting. 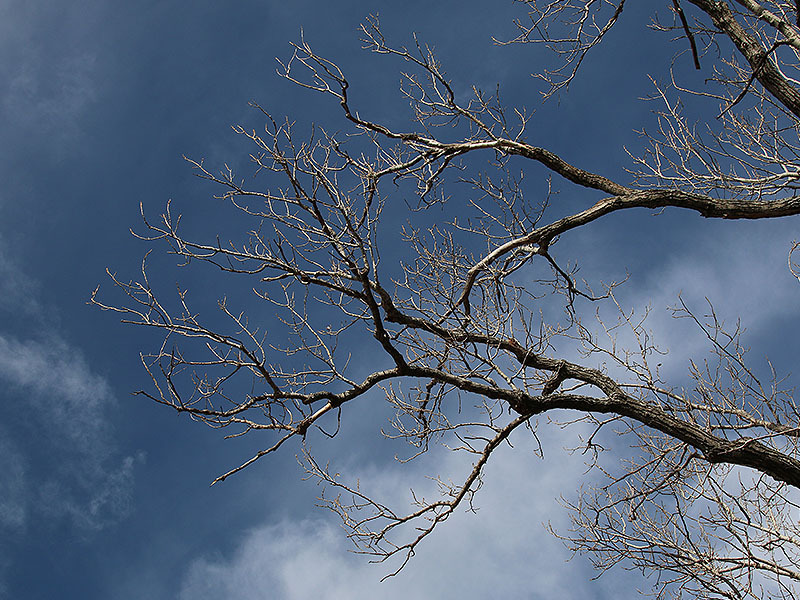 At first I almost didn’t notice the subtle change to the sky that I was seeing. 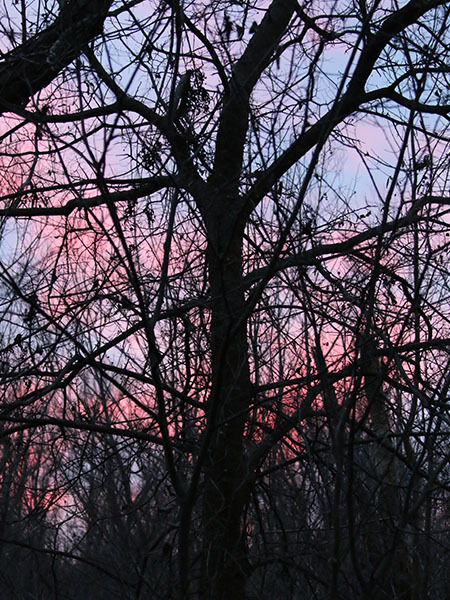 Where there was once a cold, uniform, and slightly slate gray tint to the sky, there was now a barely noticeable warm pink beginning to develop. A hint of something more to come was promised by this unusual sky, so I lifted my camera and framed the scene to get a feel for how the device might see things. As I looked through the viewfinder the metamorphosis was startling. 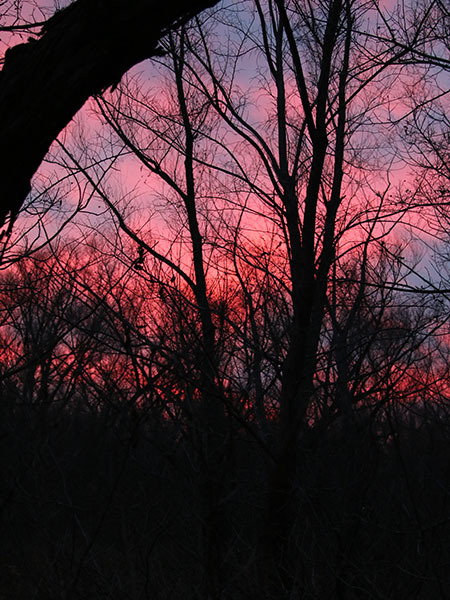 Out of nowhere the faint pink coloration began to grown deeper and fuller until right before my eyes the sky exploded in a startling array of vivid and brilliant color. 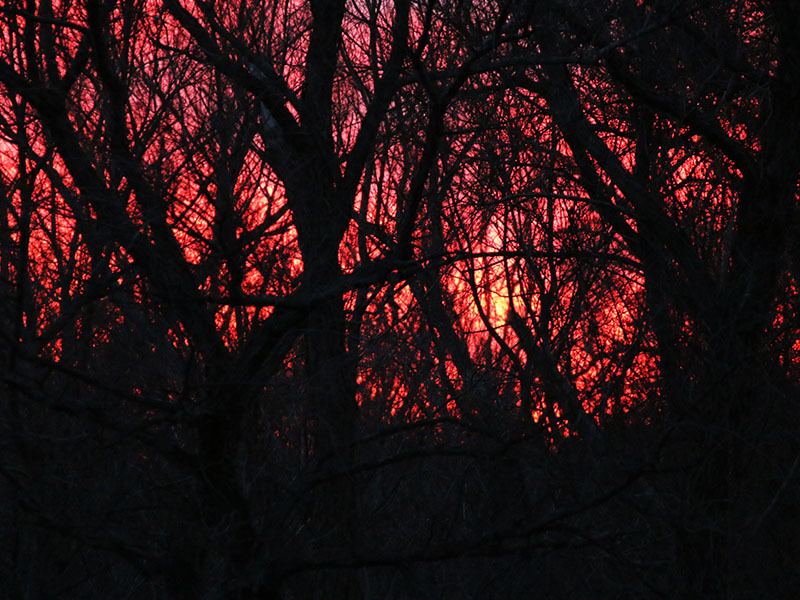 It was as if the air itself was set ablaze. The whole episode lasted only seconds. 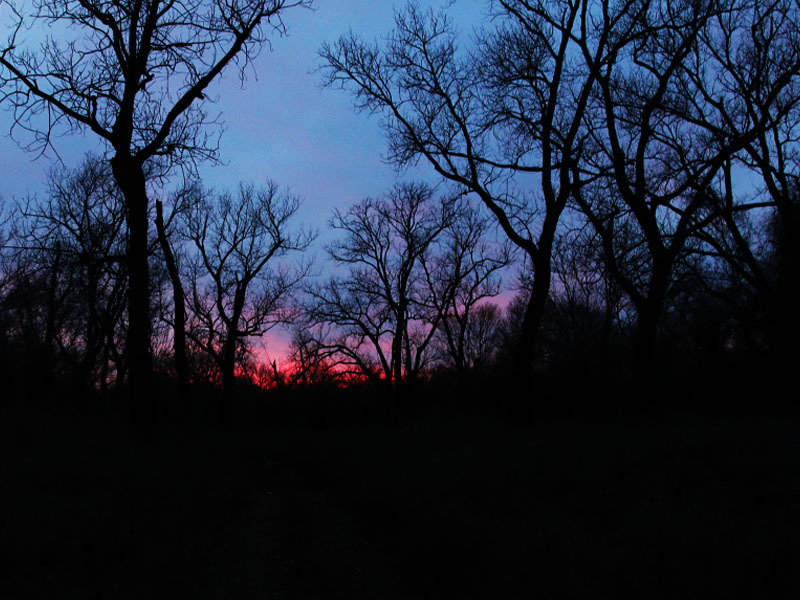 As quickly as it had come the frenzy of color was gone, leaving me stunned by how fleeting the moment had been. 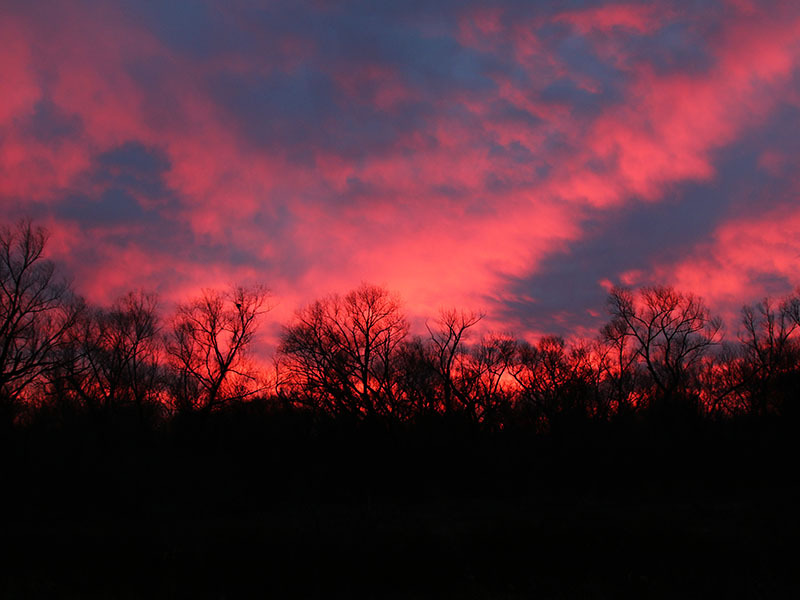 …and erupting into an explosion of brilliant colors. And as quickly as it had begun, it was over. But, luckily for me the show was not over just yet. 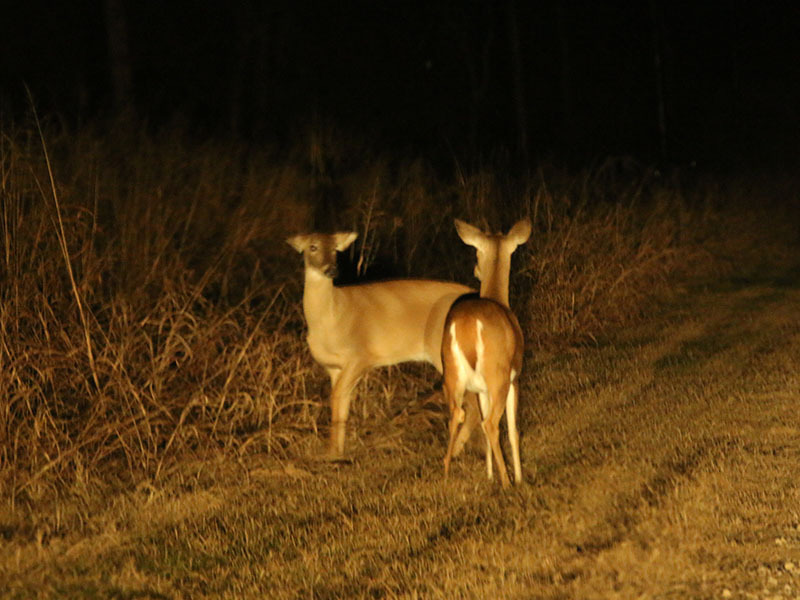 On the way out of the park, I had to stop momentarily as a small herd of deer crossed the road in front of me. 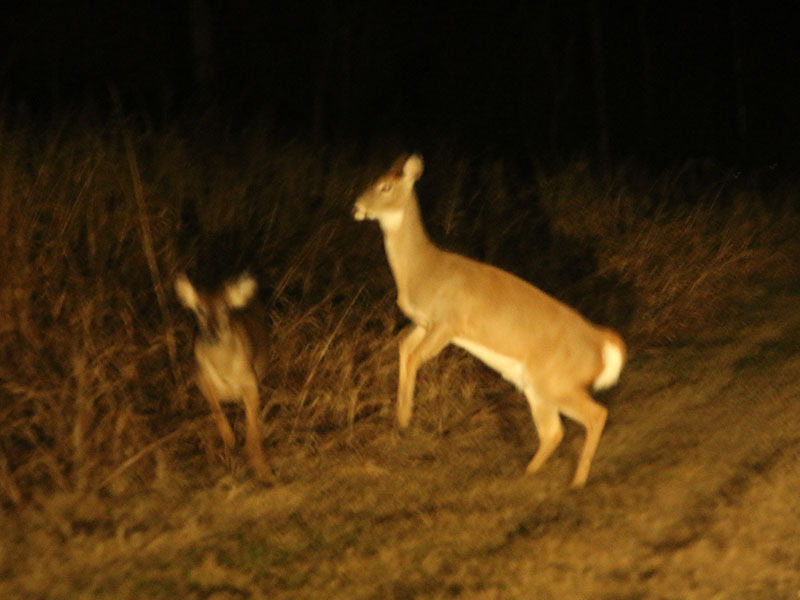 I photographed the following interactions through my car’s front windshield while I waited. 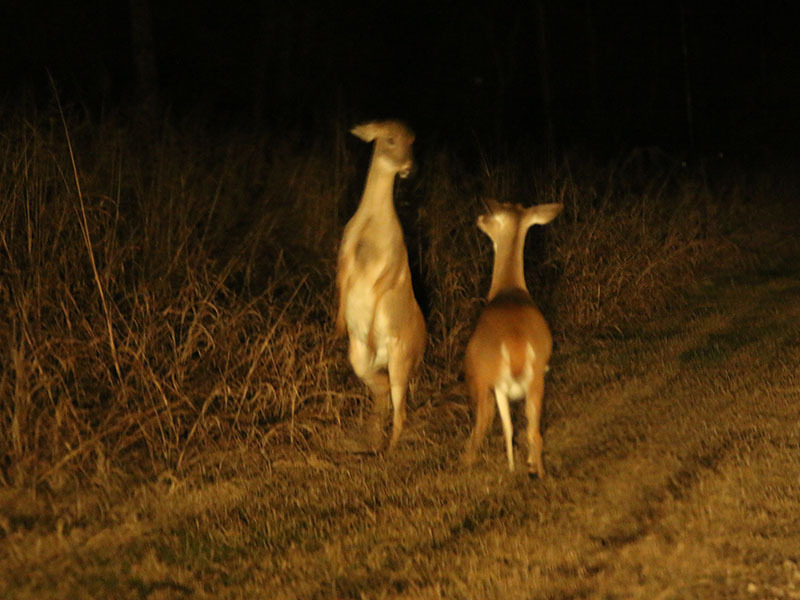 Two young button bucks sizing each other up. 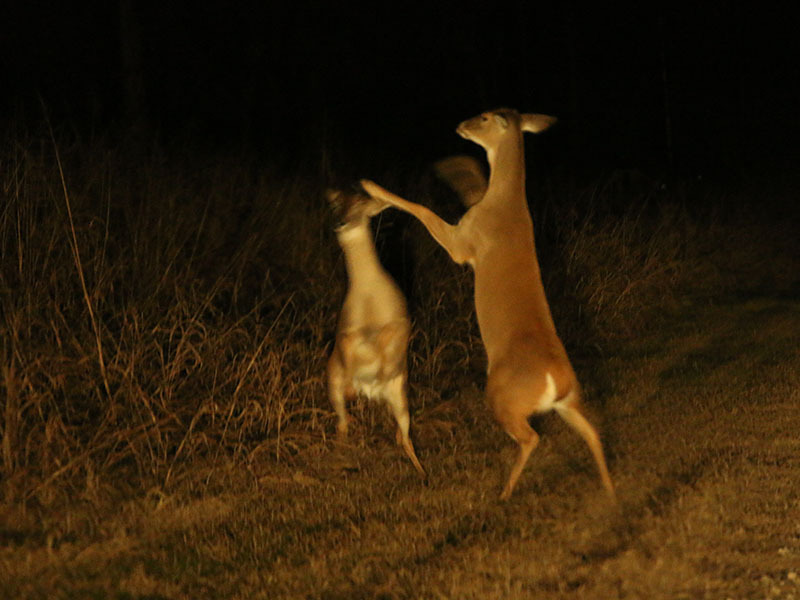 And just like the sunset, this brief dance was finished as quickly as it had begun. On my last visit the excitement began almost immediately. 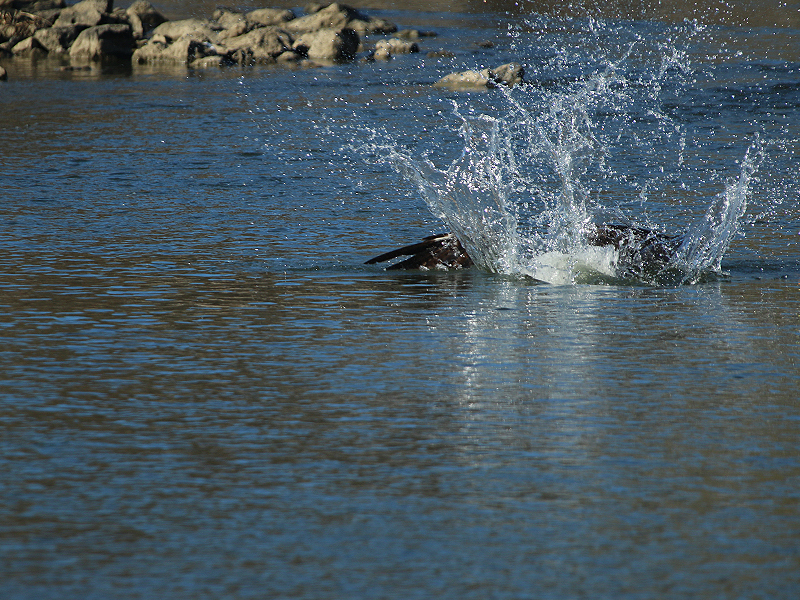 A loud splash caught my attention as I was making my way along the riverside trail. 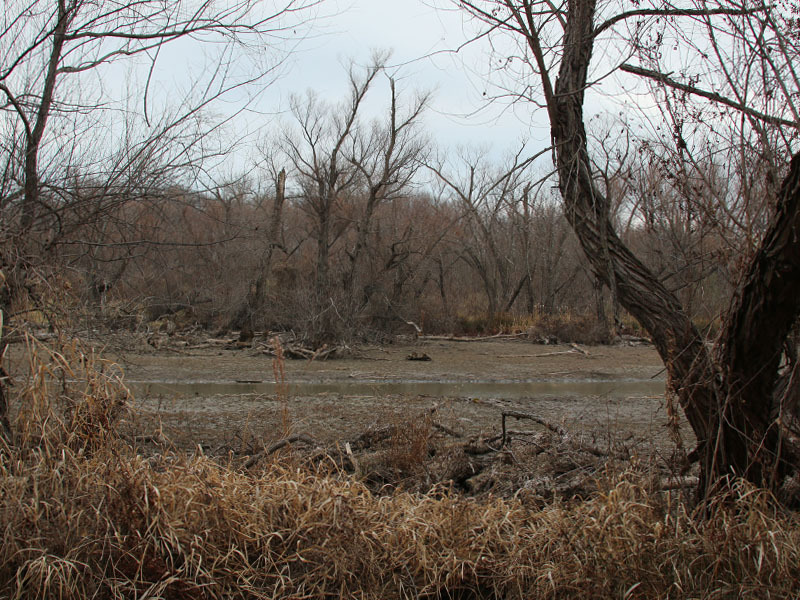 From the sound, I expected that I flushed a turtle or some other large animal into the river, but when I turned to look, I was surprised to see an Osprey sprawled in the water just off the near bank. My view was partially obstructed by vegetation, so I scrambled to find a better vantage point. 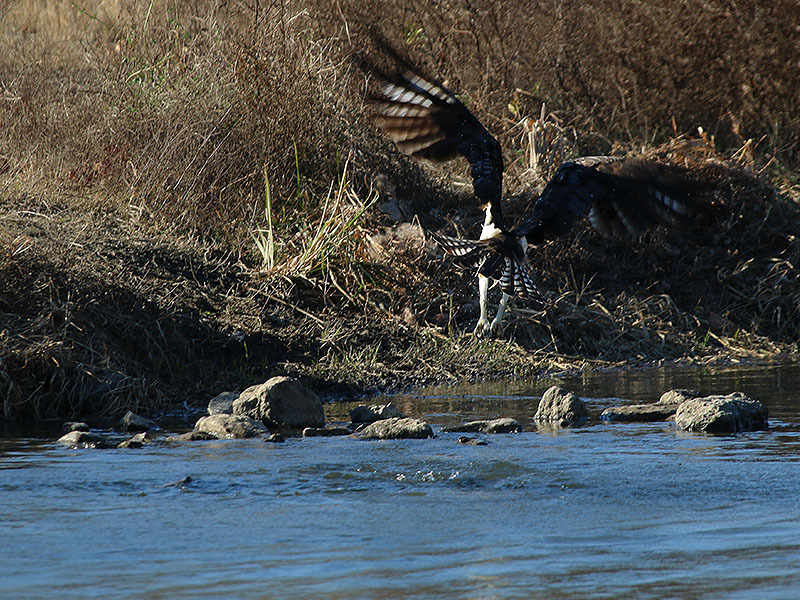 As I moved into position, the Osprey recovered from his dive, rose from the water, and took to the air once more. 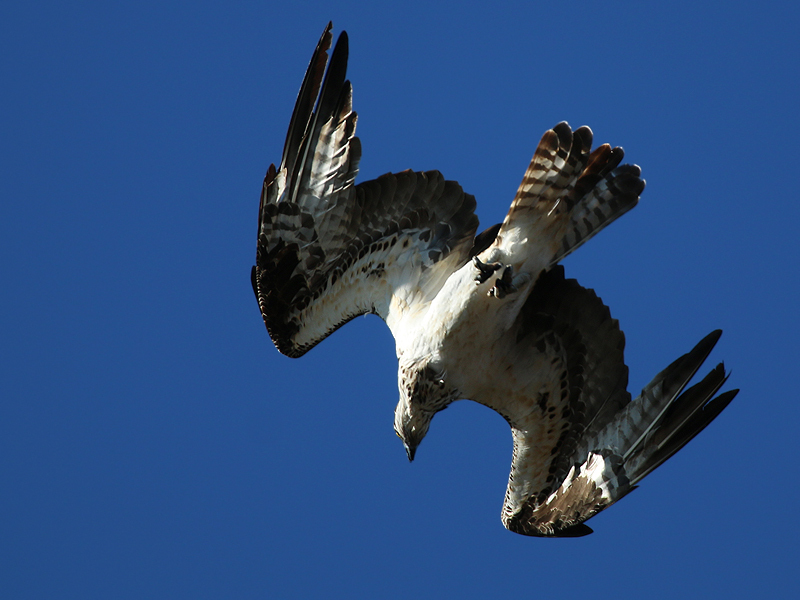 Observing and photographing an Osprey fishing is something I have wanted to do for a long time, and after this brief encounter I thought I had missed by best chance to date. 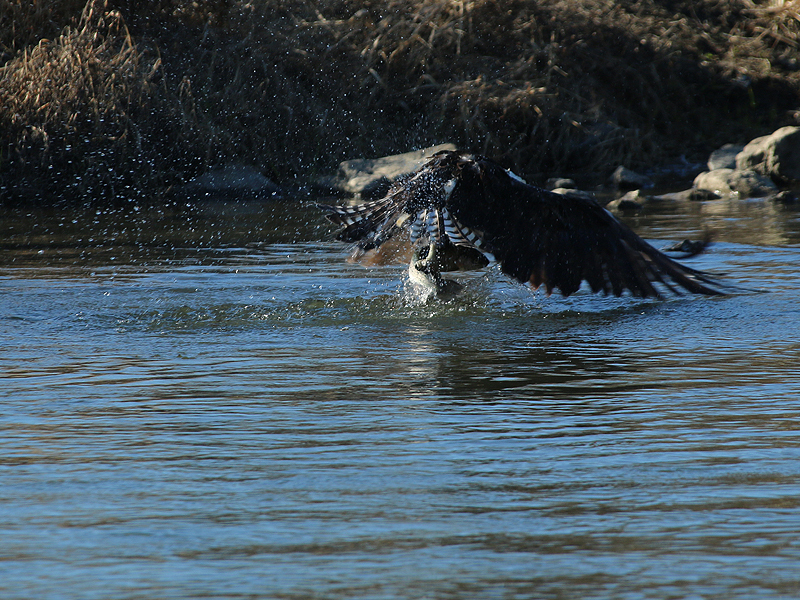 But, to my surprise the Osprey proved to be empty-handed as he came up out of the water. He did not leave the area, however, but instead big bird continued to circle overhead intently focused on something in the river. 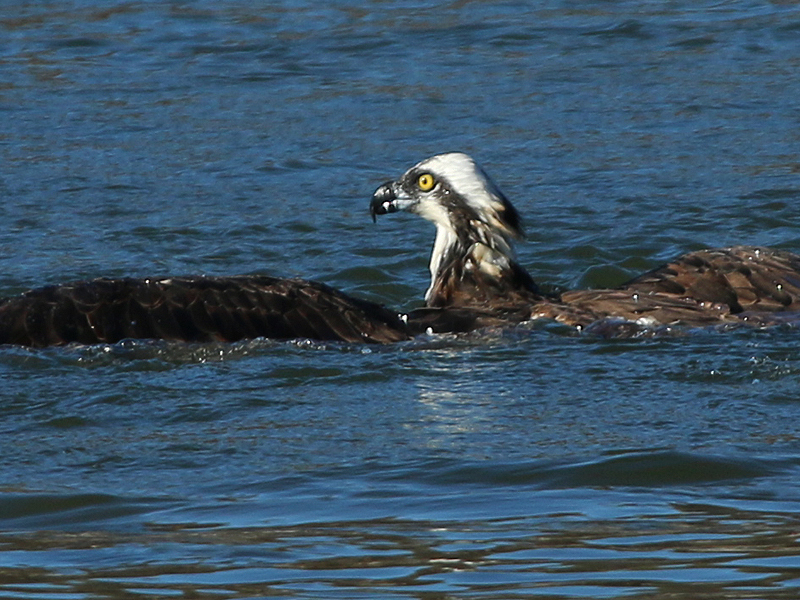 Soon Osprey hit the water again, and for a second time in a row he came away with no prize. 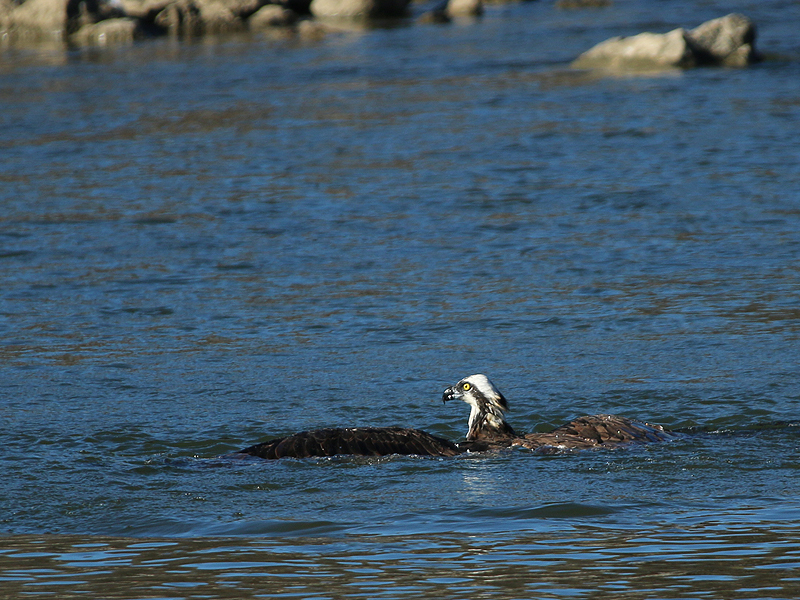 The Osprey was intently focused on something in the river. He made pass after pass. 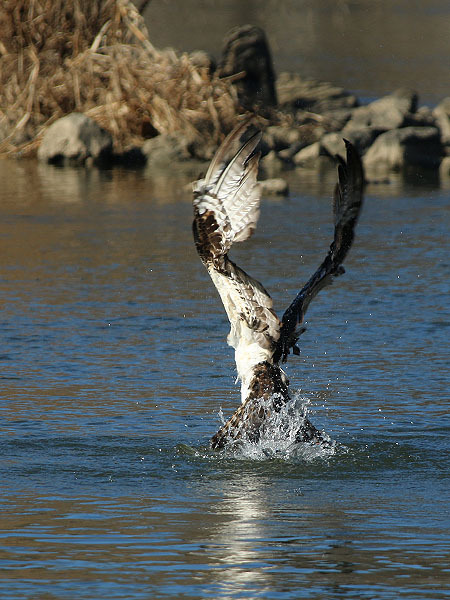 The Osprey paused momentarily as he floated atop the water. A fish eagle in the water. Flapping his wings and trying to become airborne. 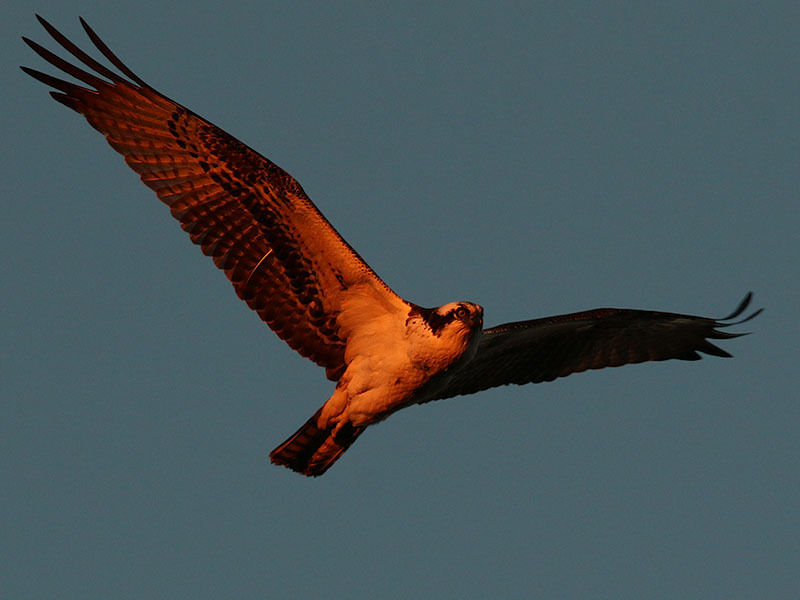 Back in the air, the Osprey soared around and around above the river. I was somewhat surprised to see him miss two consecutive attempts to catch fish. 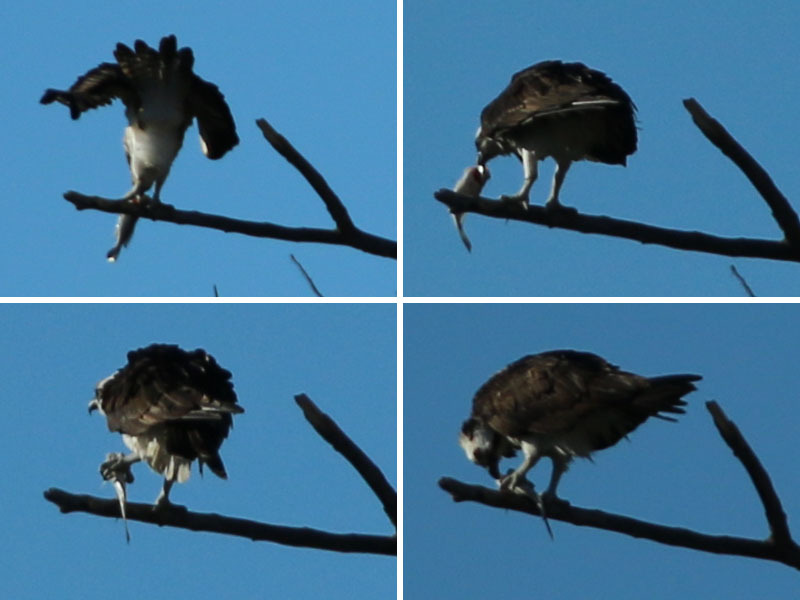 I certainly expected Ospreys to be much more competent at fishing than this one was proving to be. 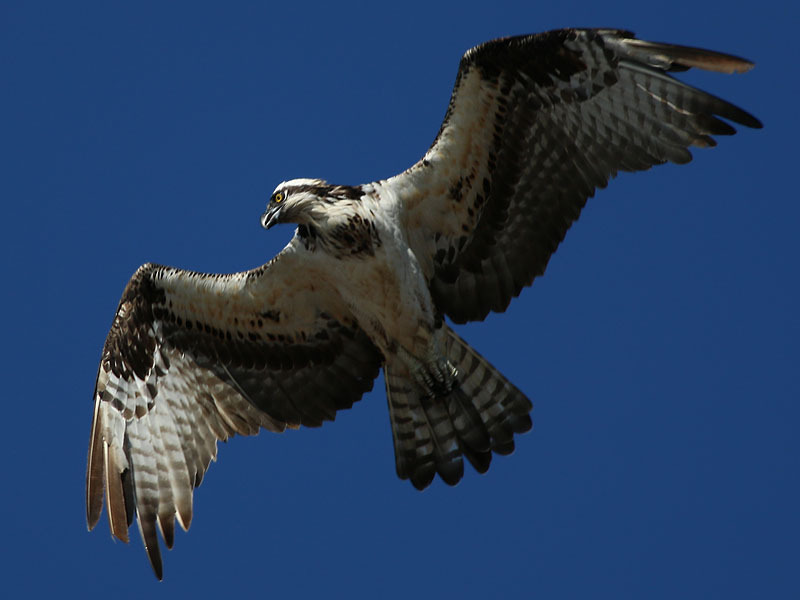 Over the next 35 minutes or so I watched as the Osprey dove and hit the water again and again—five more times in all, and each time coming away with no catch. It wasn’t until I was able to review my pictures at home that it became clear just what was going here. 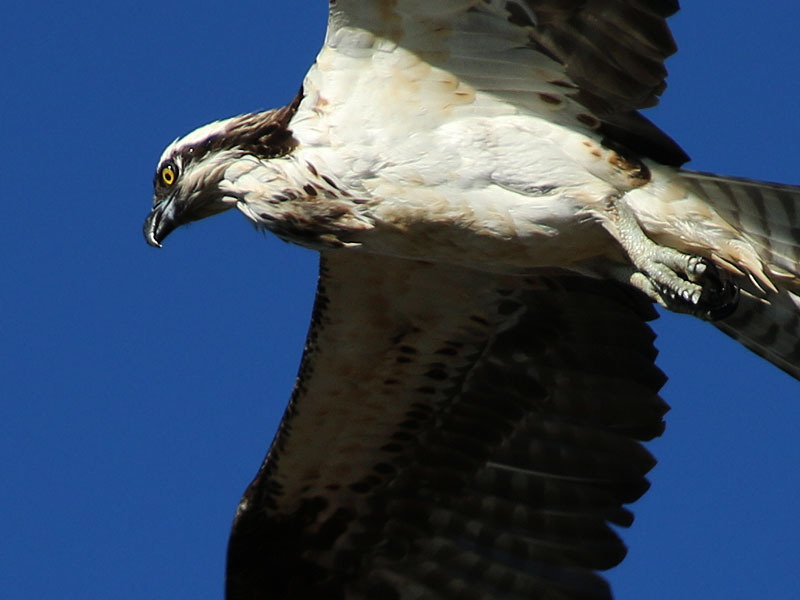 Zooming in on my photographs showed that the Osprey WAS actually catching fish each and every time he hit the water—the fish were just too heavy for the bird to haul out of the river and he was forced to let them go. Explanation? 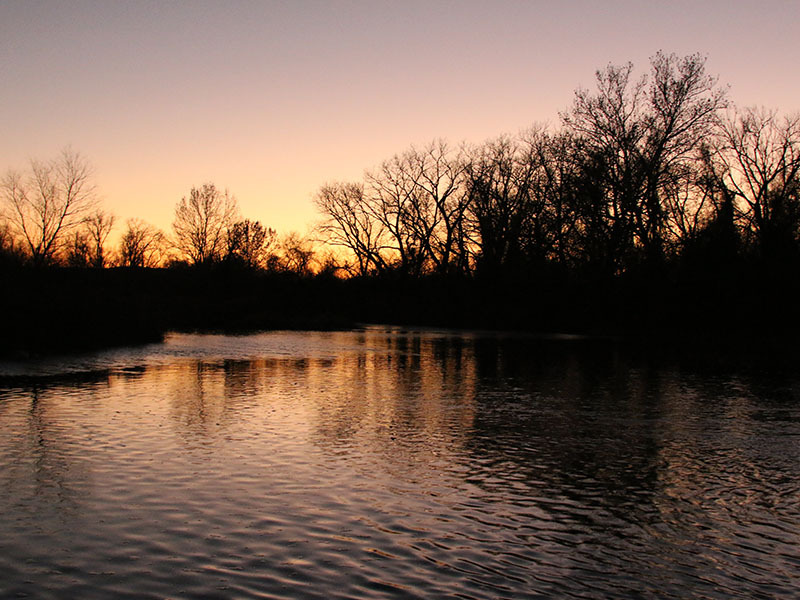 The Trinity had just recently been stocked with a large number of Rainbow Trout at this location. 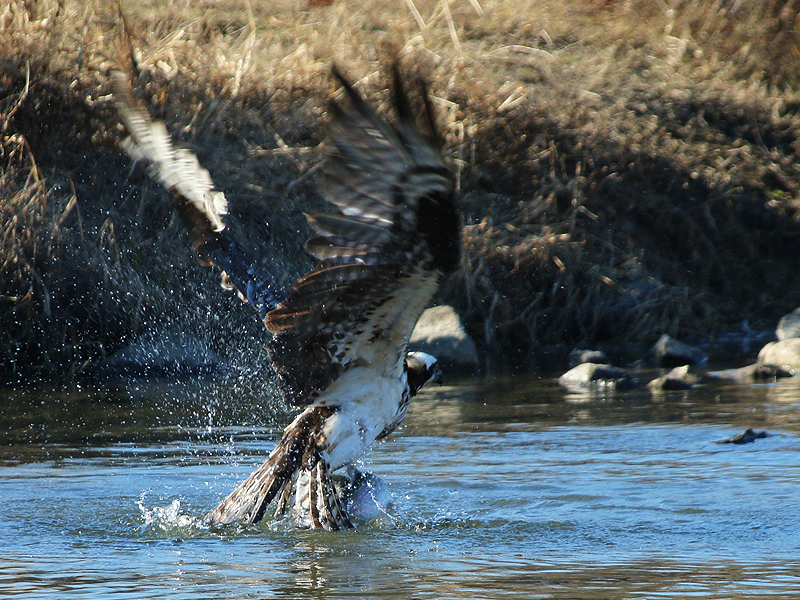 The water must have been so jammed packed full of these fish that the Osprey couldn’t resist—even with the trout that were too heavy for him to handle! I can attest from watching the action that he did not surrender his catches easily! Circling around for another pass! Struggling to pull the fish from the water! A nice, big Rainbow Trout! 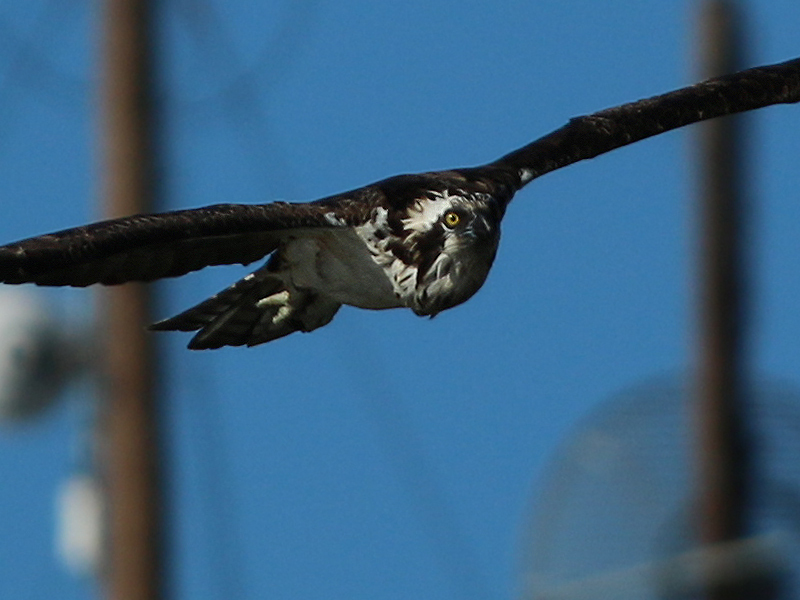 Frustrated, the Osprey flew downstream a bit to try his luck about a quarter of a mile to the south. I kept a close eye on him, wondering if the show was really over or if he would be back to try again. 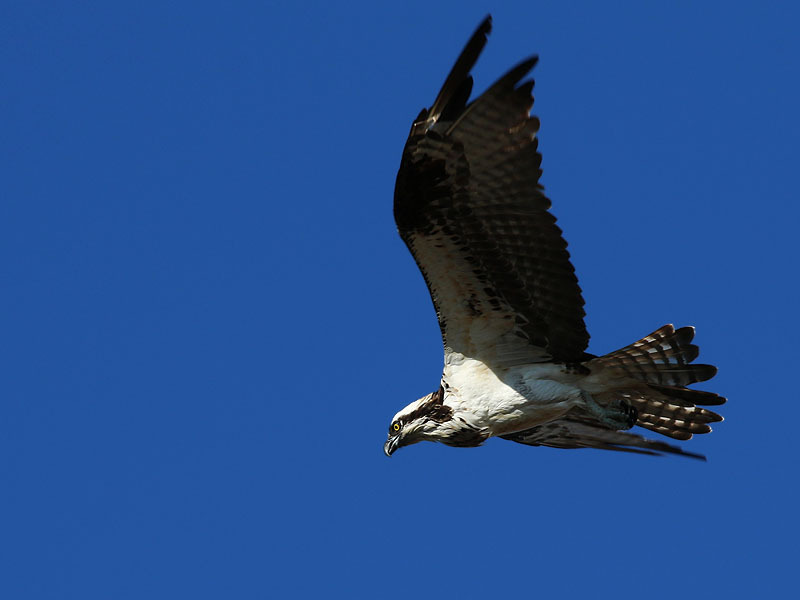 Sure enough, just minutes later the Osprey did return to give it another go—maybe he just needed a moment to blow off a little steam and recompose himself. The determined raptor wasted no time upon his return. 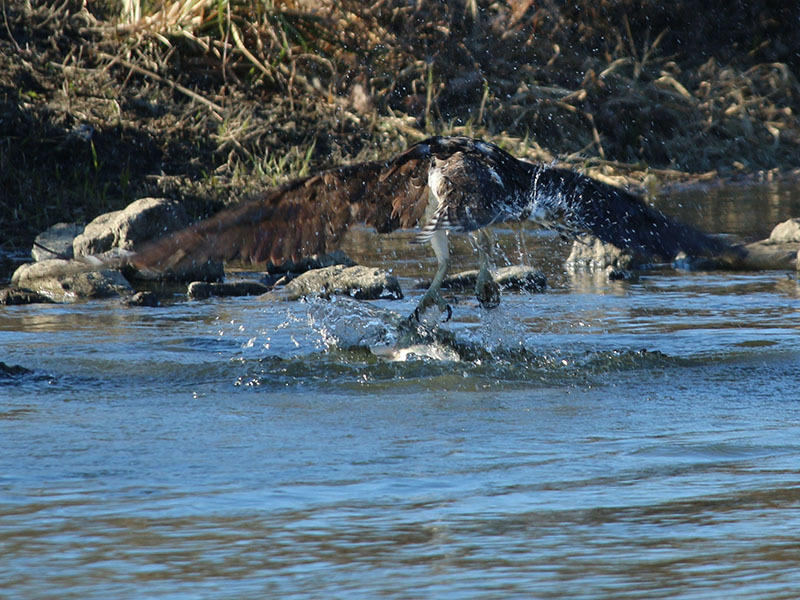 A quick dip down towards the water and the fish eagle easily snatched a small bass from the water, barely getting his feet wet in the process. 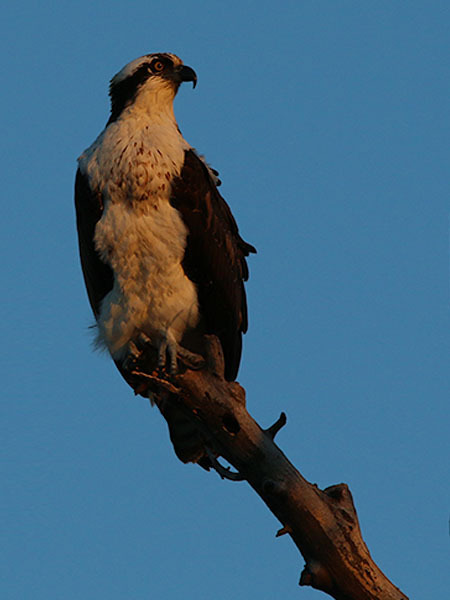 The Osprey then lighted on a nearby tree to eat his hard earned meal. 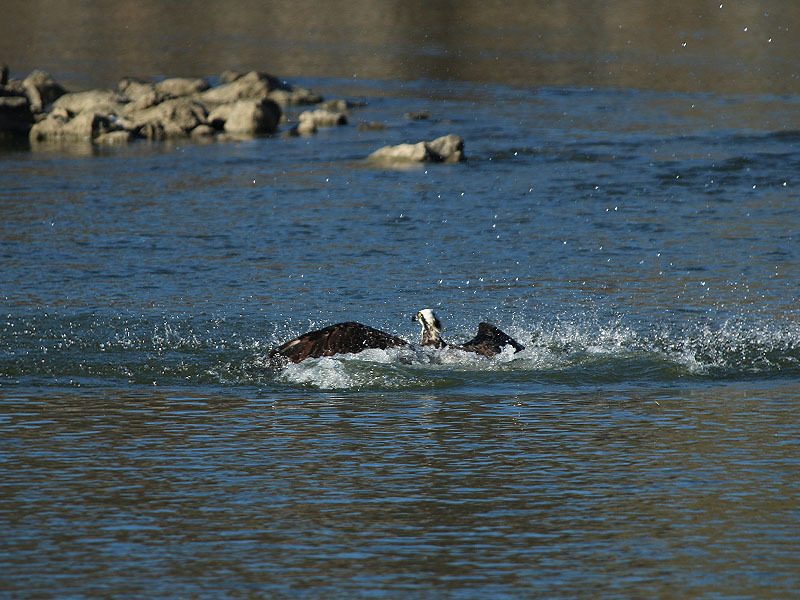 This is how I expected an Osprey hunt to go! Circling over for one last try. 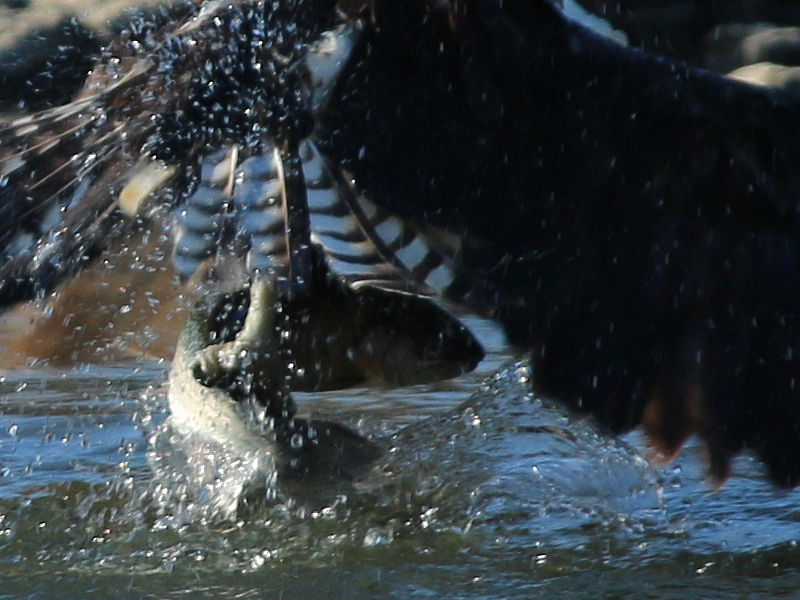 The Osprey plucked this smaller fish from the water effortlessly. He took the small bass to a nearby tree to feed. Spending around an hour watching this wonderful show left me with only a little over two hours to spend at my planned spot (but, I’m not complaining), so I hurried on my way. 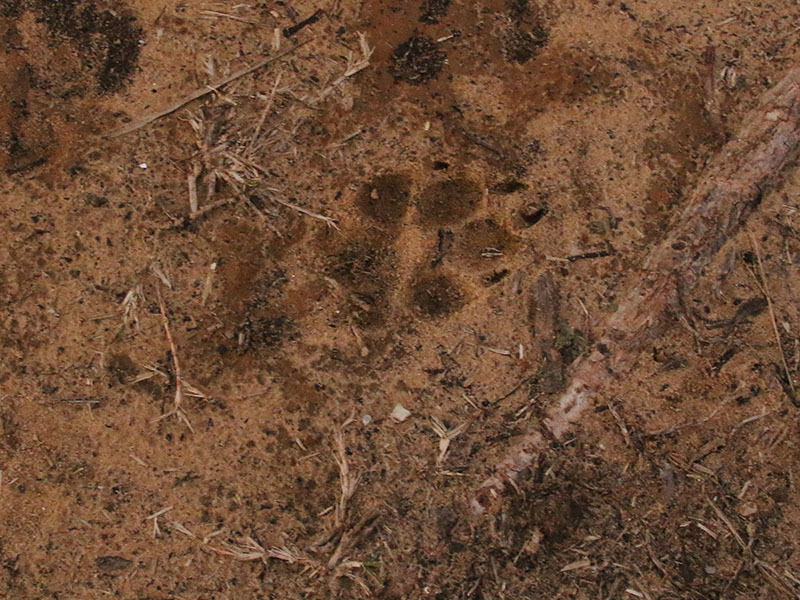 A well preserved Coyote track. Soon, I was back on location and setup in just about the same place I had been a couple of days earlier. A menagerie of my feathered friends began showing up just a few moments later. 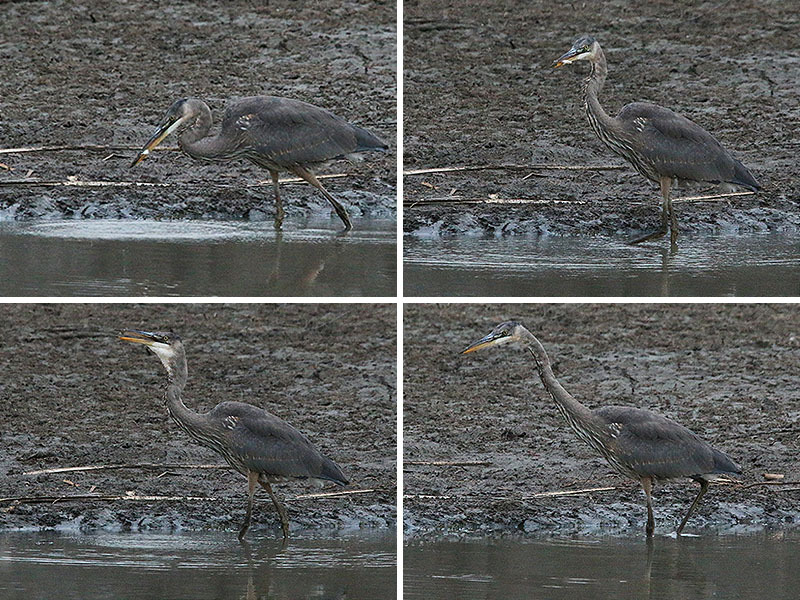 The old reliable Great Blue Heron made pass up and down the channel while I watched from only a short distance away. He lunged out on a number of occasions but I never saw him secure a fish on these attempts. 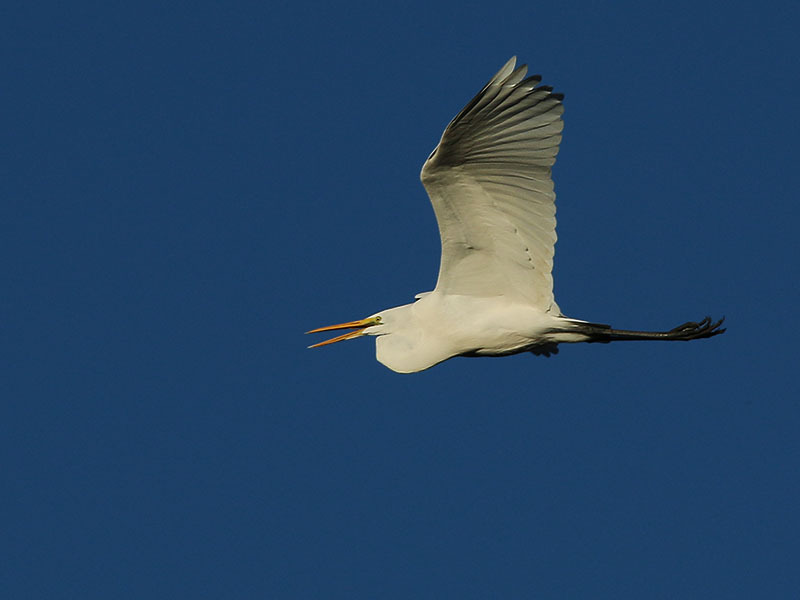 Next came a graceful Great Egret. 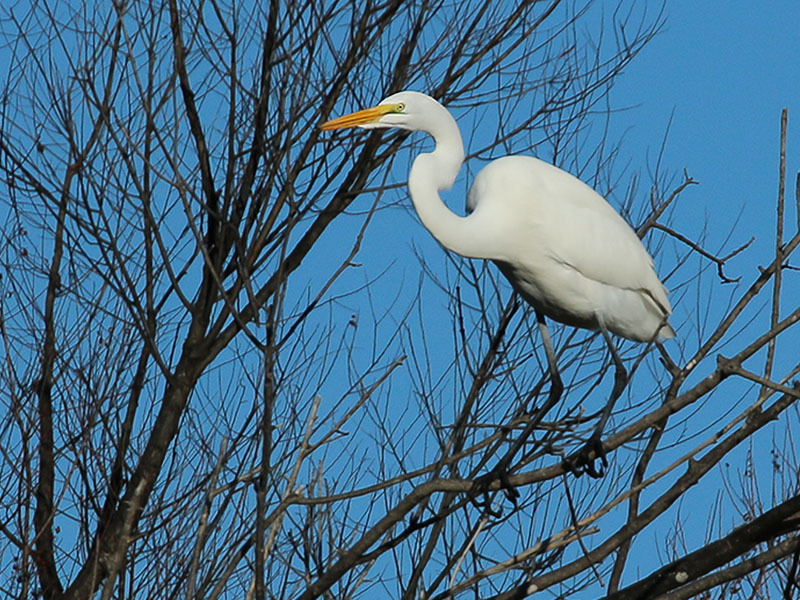 This big, white bird flew in and spent a few minutes perched on a branch across the way. He seemed to be keep an eye on a lone American Coot swimming in unusual solitude in the water below. Then it was time for a rowdy group of crows to make an appearance. 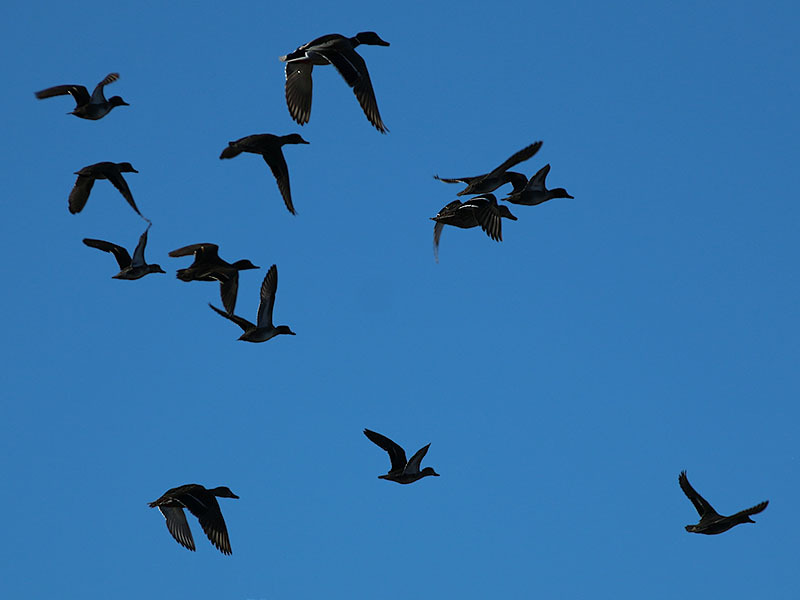 These guys are frequently obnoxious and often seem to be up to some kind of mischief—in other words, they are my kind of birds! At my destination once again. 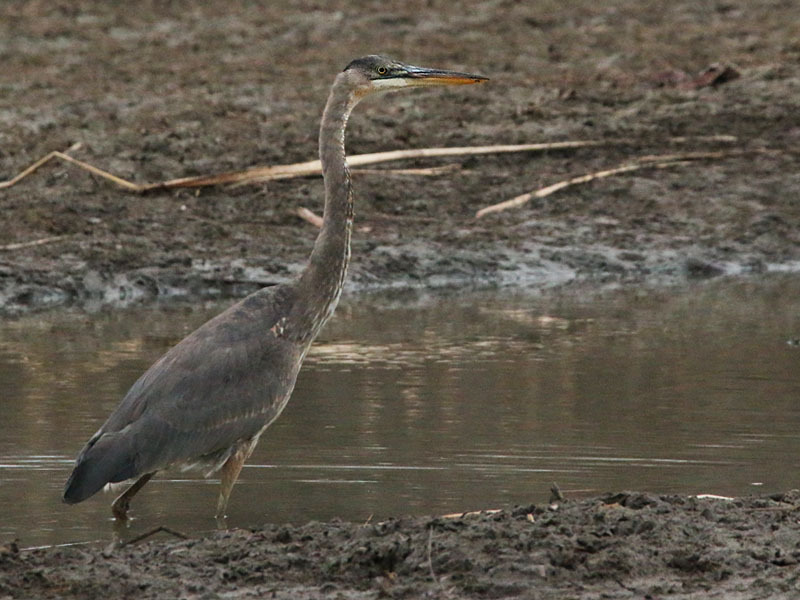 The Great Blue Heron was obviously a regular at this spot! 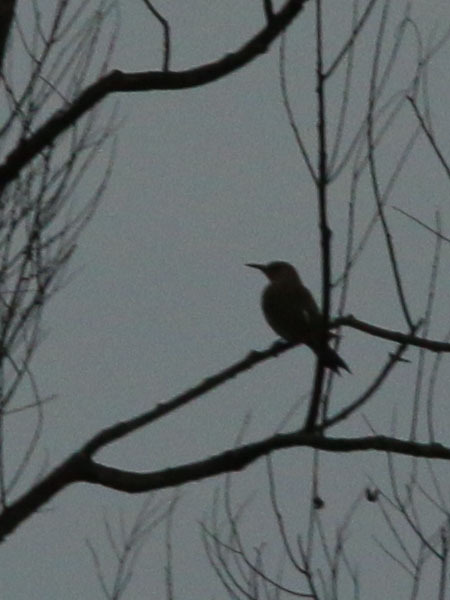 …and perched momentarily on a nearby tree. 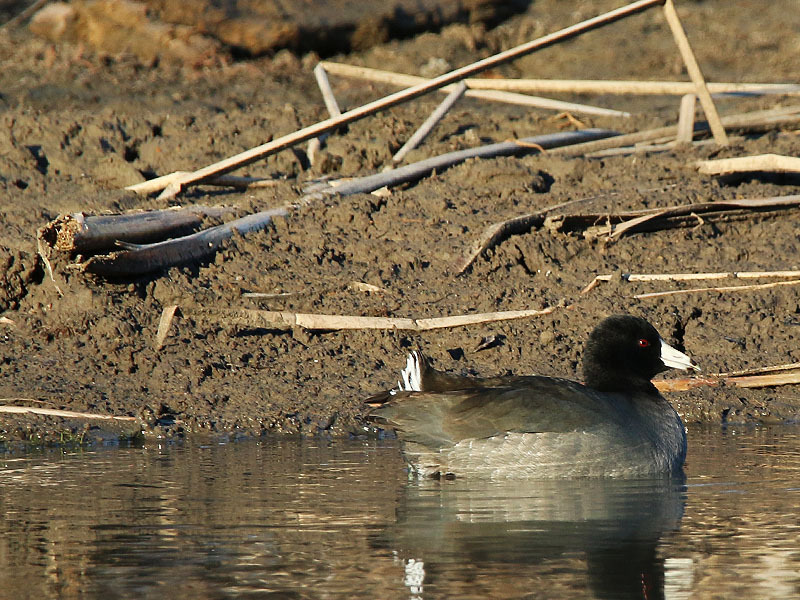 A lone American Coot swam up and down the channel. 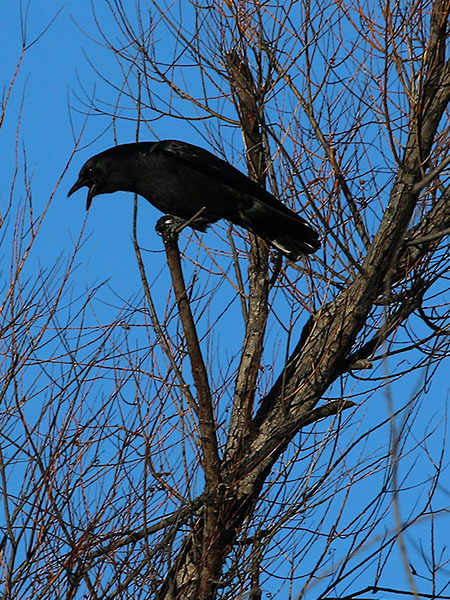 A murder of raucous American Crows paid us a brief visit. 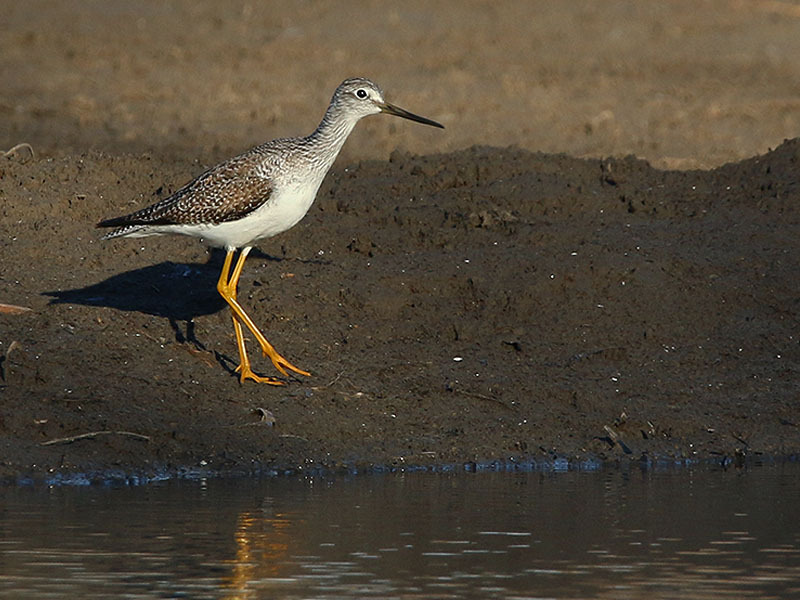 A few Greater Yellowlegs arrived at the water’s edge for a brief bit of foraging, but they were skittish for some reason and did not stay long. 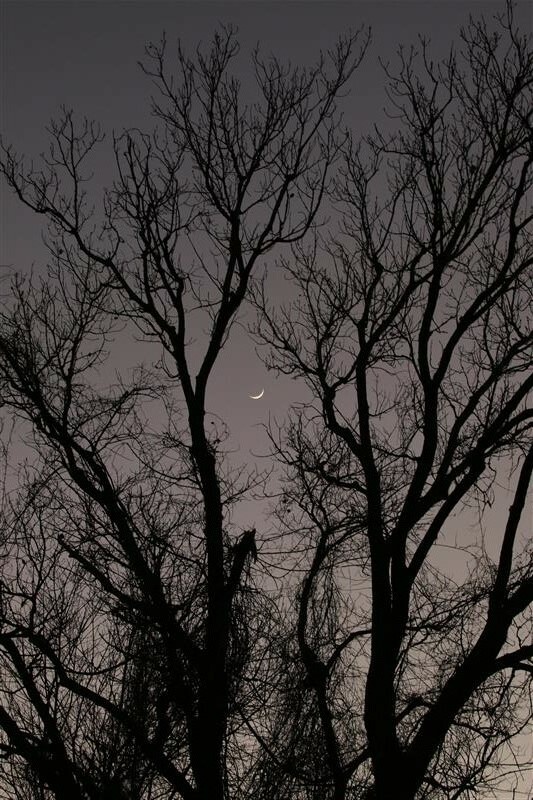 As the evening wore on and the shadows grew long, I made up my mind it was time to call it a day. 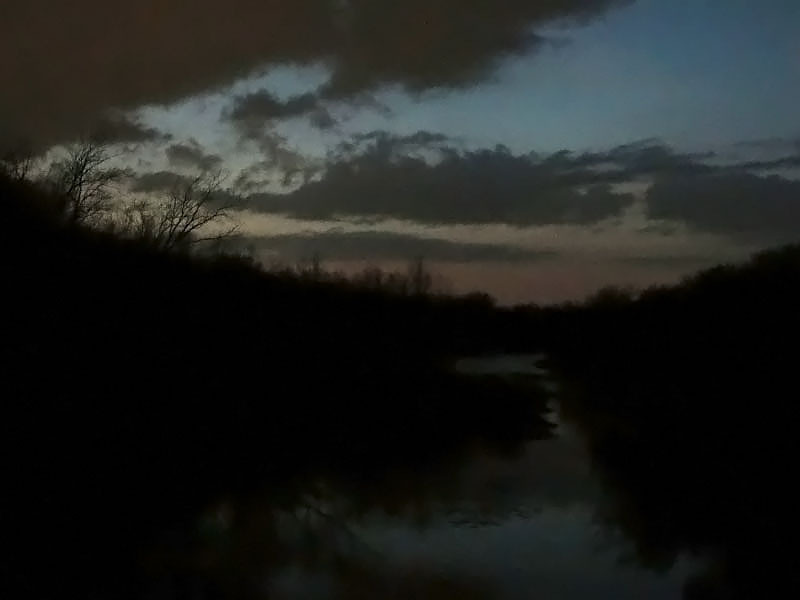 As much as I did not want to leave, I was losing light fast and it would be too dark for pictures soon. 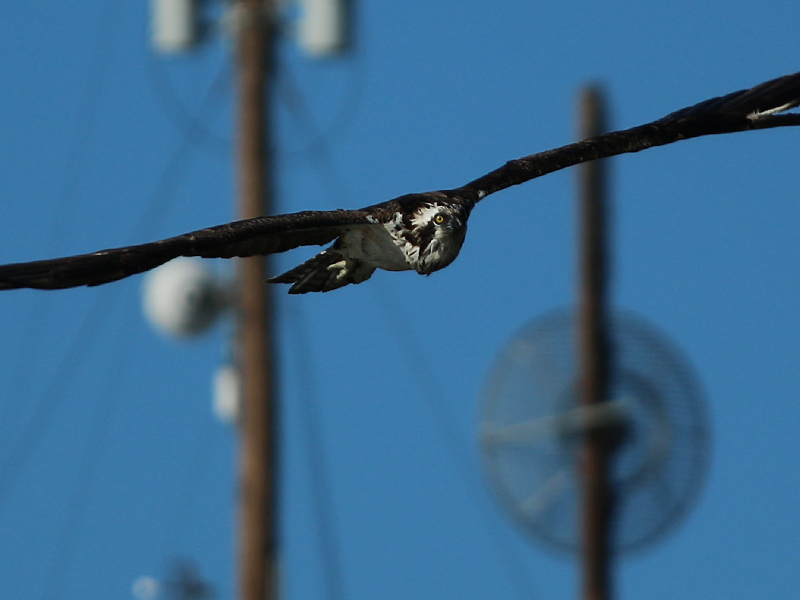 Just then another Osprey flew in and landed on a branch just slight above and behind me. Fortunately, I was in a good position for pictures and was able to snap a few shots of him as he made his landing approach. 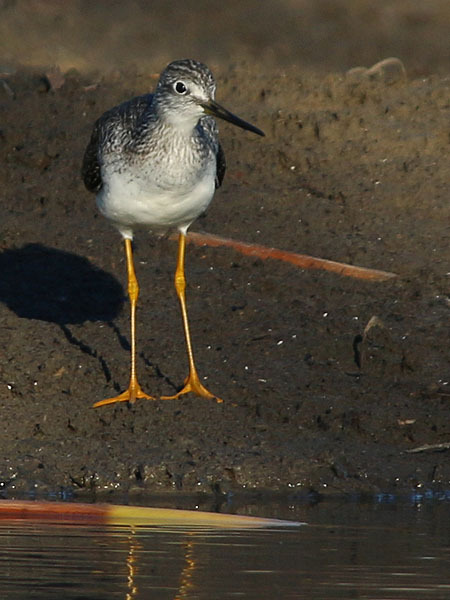 A Greater Yellowlegs operating along the bank. Those legs are certainly yellow! 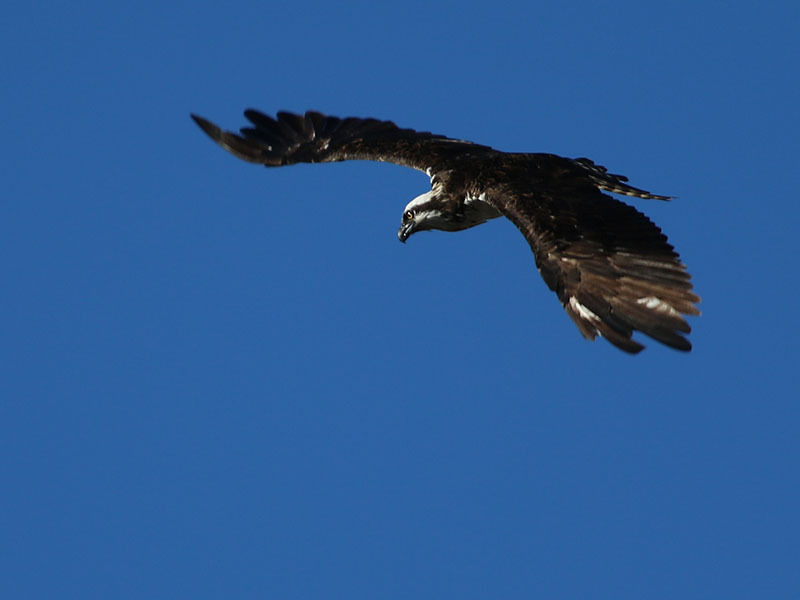 An Osprey flew in a perched just above where we were sitting. 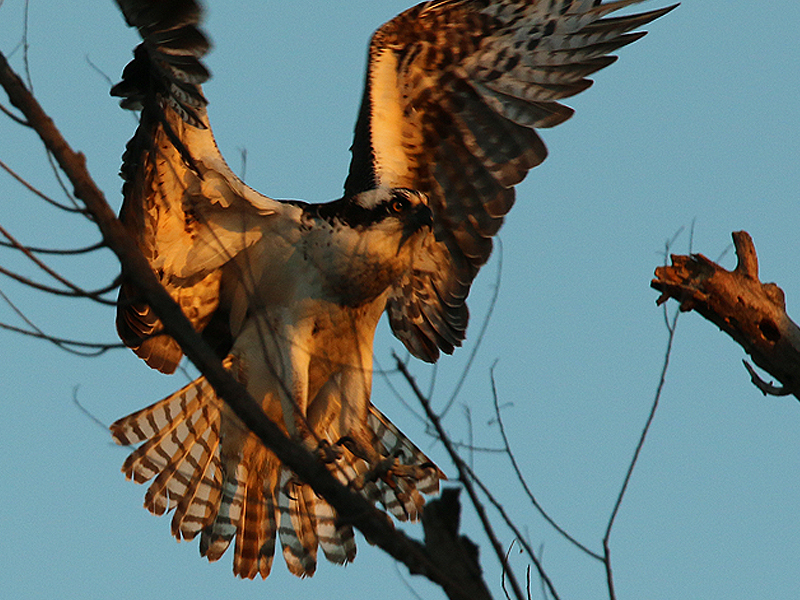 The bird was magnificent in the warm, late afternoon light! 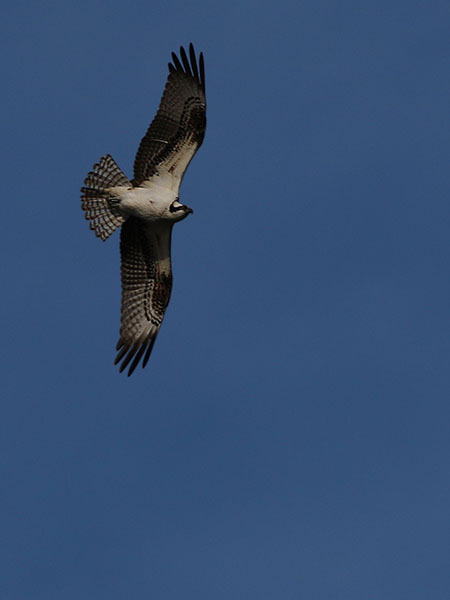 The Osprey did not stay long however. He must have had more important things to do. 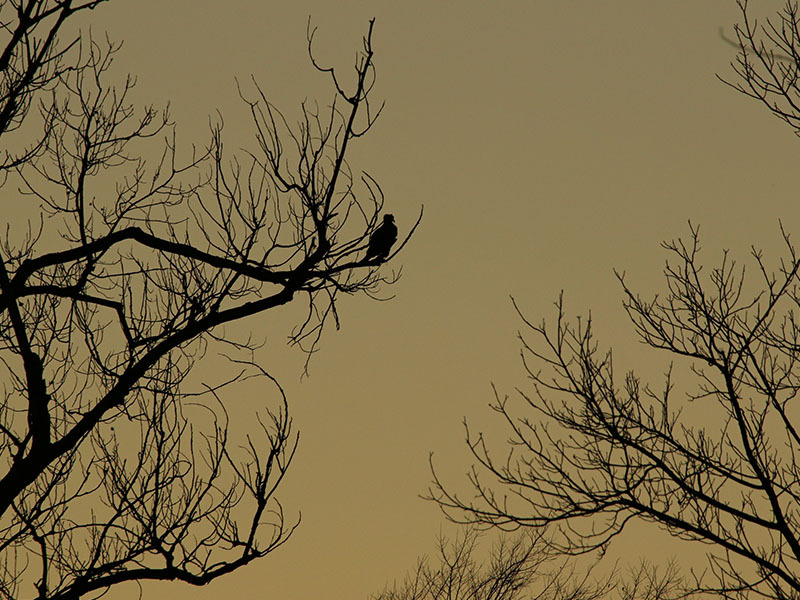 He launched into the air, circled the mud flat a couple of times, and then he soared away to the east softly illuminated by the warm light of sunset. 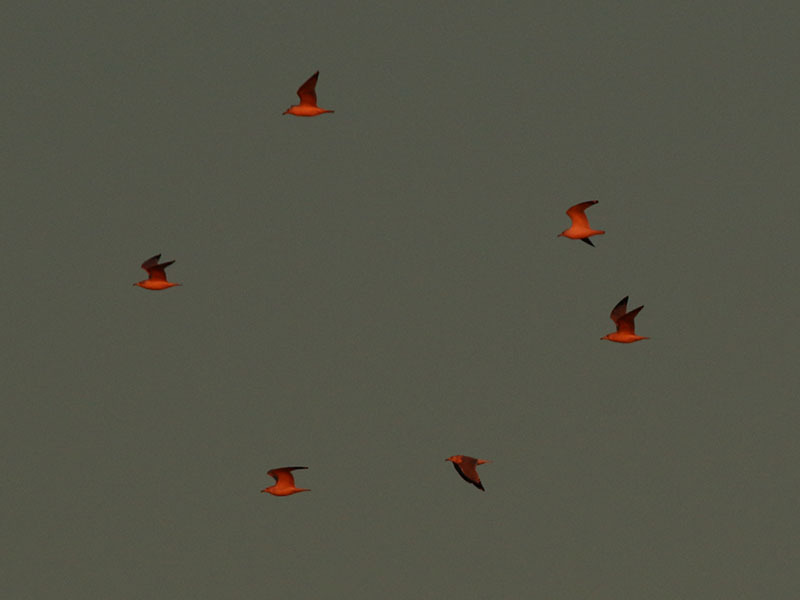 That is when I noticed hundreds of similarly red-tinted Ring-billed Gulls making their way north to the lake. There they would spend the long cold night on the water safe from predators and other disturbances. 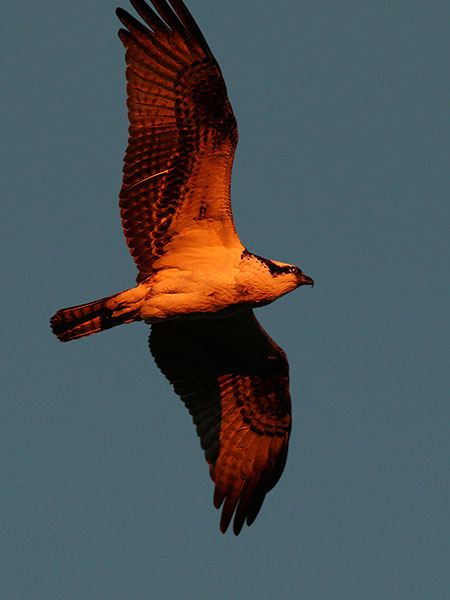 …and soaring away in the soft light of sunset. 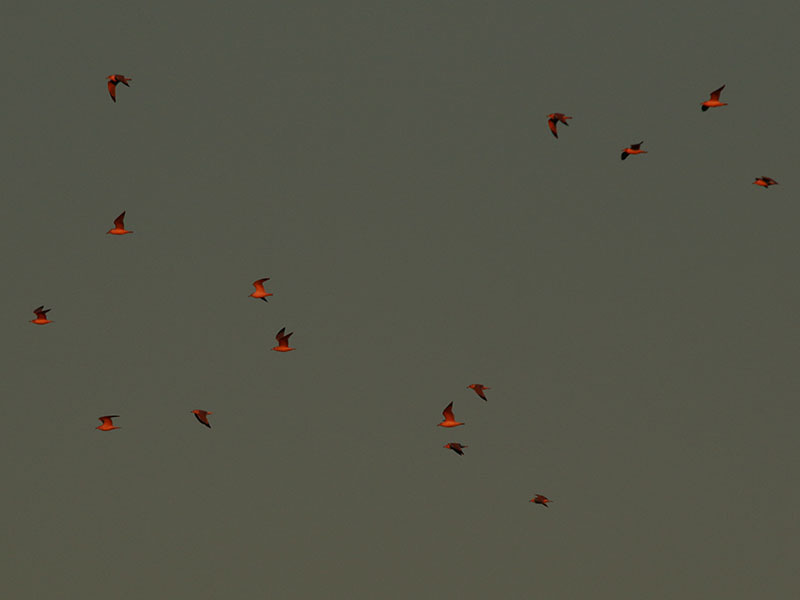 Hundreds of Ring-billed Gulls headed for the lake as night began to fall. The lake will provide a safe refuge for these gull through the long night. 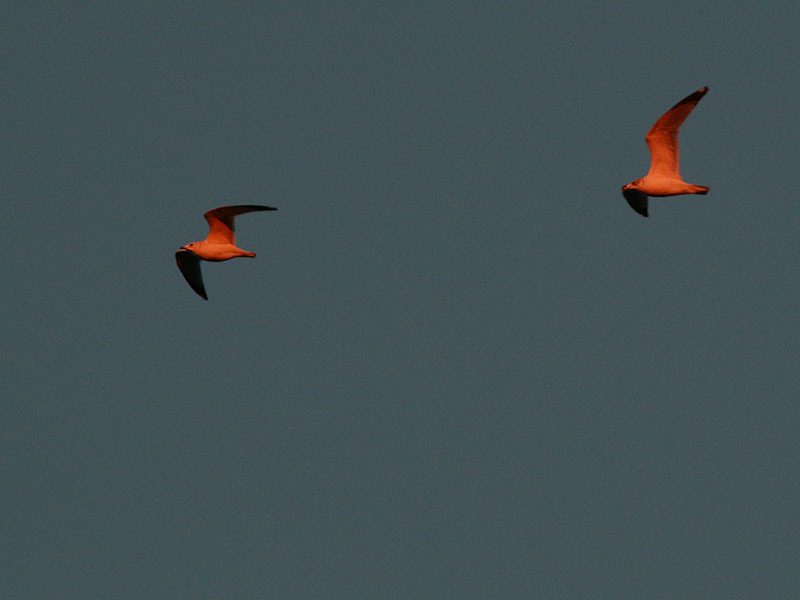 Ring-billed Gulls going to roost. 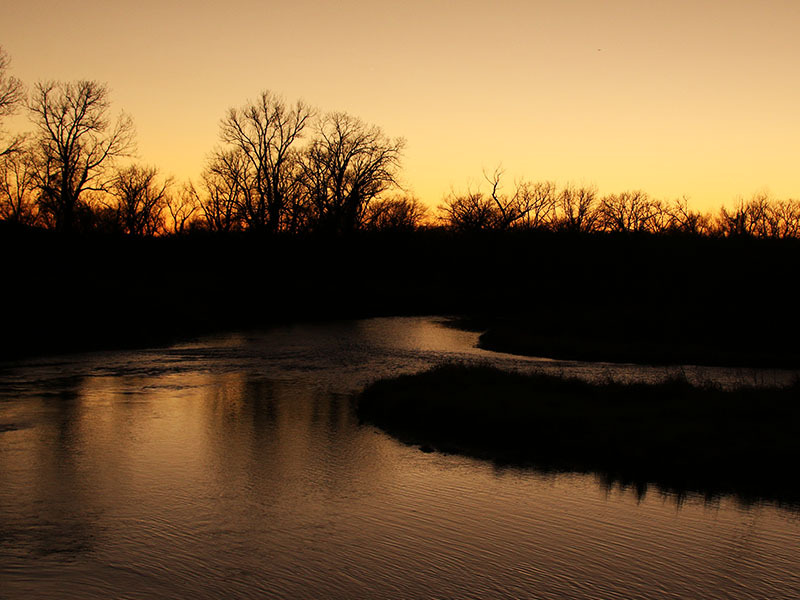 On the way out I was treated to one more spectacular winter sunset—this time as a backdrop to the Trinity River itself. Beautiful! What a great couple of days… There is no question that the holidays are always over too quickly! 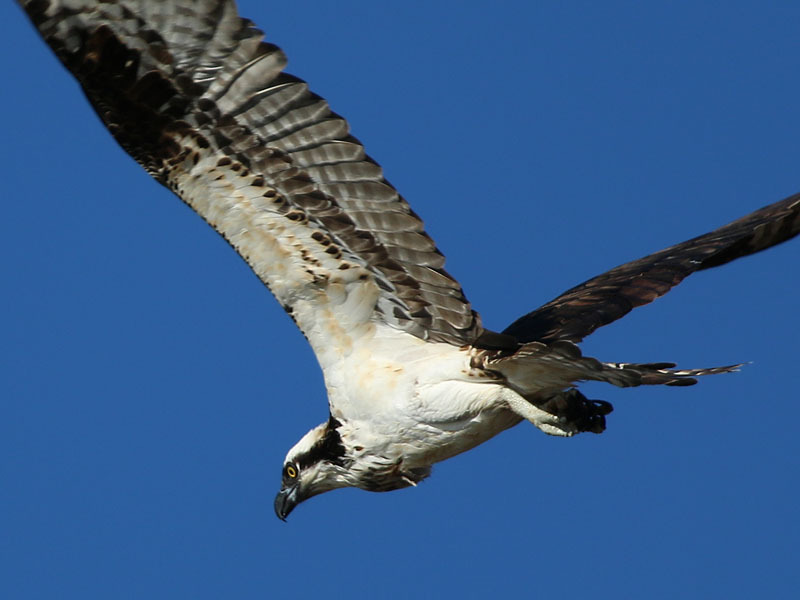 I spotted one last Osprey as I made my way back to the car. Can you see him? It was going to be another glorious sunset! 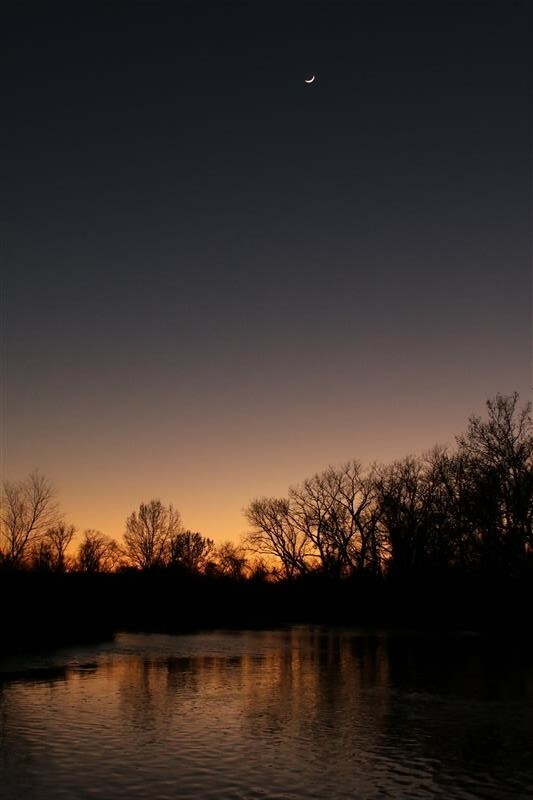 The sky aglow over the Elm Fork of the Trinity River. …before the end of the day. Wow! Really amazing pictures! That too is one of my favorite places to go and hike! Thank you for sharing these with us! 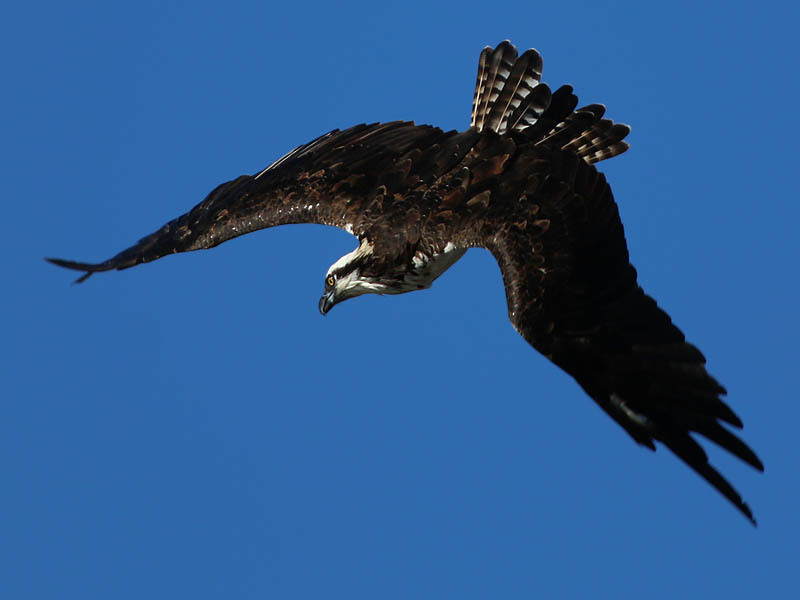 Beautiful photos of the Osprey hunting and feeding, thanks.